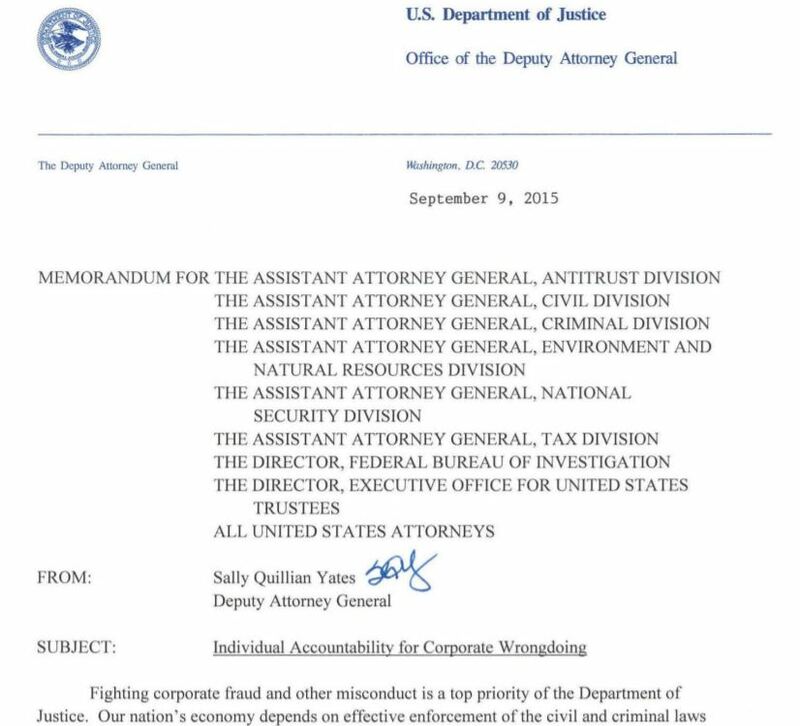 In 2015, then Deputy Attorney General Sally Yates issued a DOJ memorandum on the subject of Individual Accountability for Corporate Wrongdoing, available in full here. Known as the Yates Memorandum, the DOJ issued this directive to focus on holding individuals responsible for the illegal acts of the corporations for which they worked. [T]he Yates Memorandum is likely to result in continued waivers of the attorney-client privilege and attorney work product protection, even if the DOJ does not make express requests. Waivers no doubt aid the DOJ in criminal and civil investigations, but they also undermine and weaken the attorney-client relationship and the ability of corporations to effectively negotiate with the DOJ during enforcement actions. Professor Mark proposes tweaks to the memo, including making explicit that DOJ will not implicitly require privilege waiver for cooperation credit. Still, the Yates Memorandum could benefit from some tweaking. If the DOJ is serious that it does not seek waivers of the attorney-client privilege or attorney work product doctrine, then it probably should make that explicit. Currently, the Memorandum merely states that the DOJ does not require waivers. This is a very different situation from one in which companies nevertheless feel compelled to waive in order to obtain cooperation credit. Similarly, the DOJ should make clear that participation in a joint defense agreement will have no negative impact on whether, or to what extent, a company receives cooperation credit. The article is a good read, and not just because it cites my article, co-authored with Ty Howard, titled In-House Counsel: Protecting the Privilege in a Post-Yates Memorandum World, 31 Corporate Counsel, No. 3, June 2016 (available here). You may access Professor Mark’s article, The Yates Memorandum, 51 U.C. Davis L. Rev. 1589 (2018), here. Lawyer Reveals Prospective Client’s Communications—How did Disciplinary Board React?